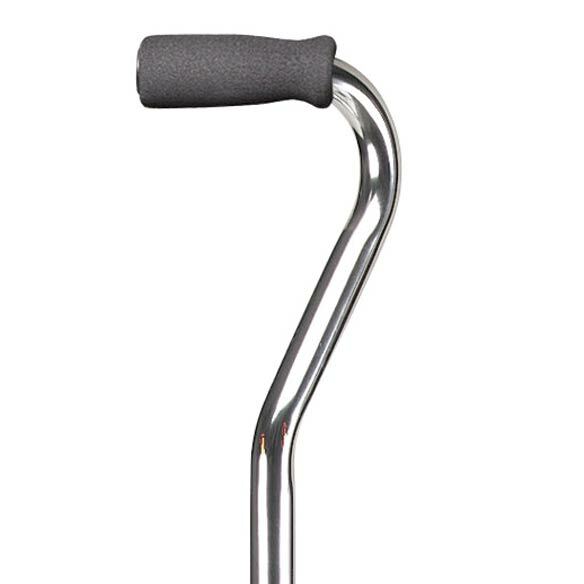 This adjustable quad cane features a four-point base with non-slip rubber tips and an offset foam grip. 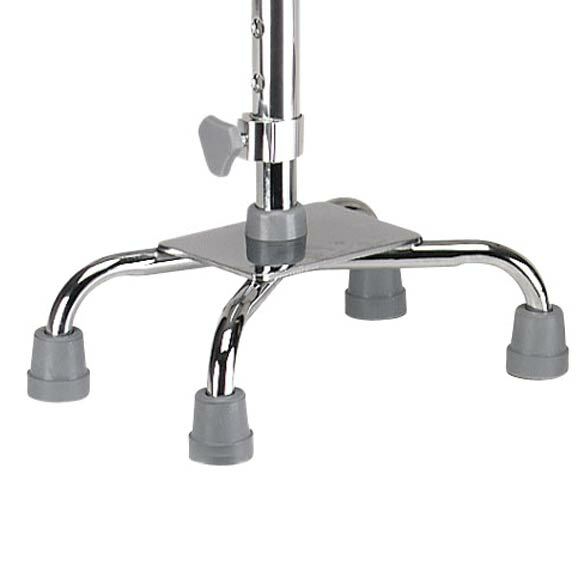 Aluminum quad cane adjusts from 30"-37 1/2" and supports individuals up to 300 lbs. Base is 8 1/4" x 5 1/2". Indispendable item in my life. My old quad is well worn from use, so I needed this new one to just keep in car so it looks nice when I go somewhere. Your quad had a much better price than a medical supply source. Thanks! This cane helps stabilize me so that I can move around my small apartment more easily. I am off-balance since I had a stroke, and those 4 feet really help me walk. I don't have to maneuver a walker around furniture or hold on to the furniture for stability. So far I have only used it indoors. I selected this item because it has four feet. I believe it will give better support as opposed to the single cane. My present cane keeps falling over. It is the correct size especially the base! Have one that is old, old and want one just like it. Best for me! I liked the size of the quads. Not too big. have needed a cane for a while. Very reasonable price. The quad is a lot more steady. I picked this item because the one I am now using is a fold up cane and I need something that is more stable and with better support and this item is definitely more stable it also supports more weight then the current one I am using,also it is a GREAT price I have searched all over and this is the best price. Thank You. I hope this helps others in need of this item decide. TO REPLACE A CAN I HAVE LIKE THIS THAT CAN NO LONGER BE USED. Need for back problems. Price is very resonable. 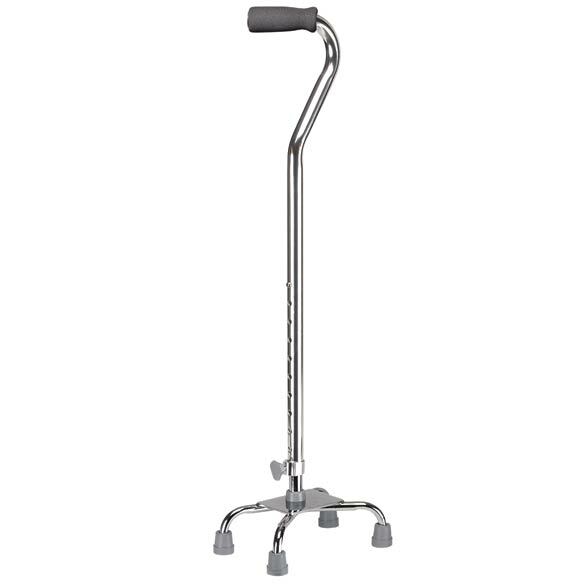 Need more help with my legs than with a regular cane. It got good reviews and I needed a more stable cane that would remain standing unlike the one I already have. she has one now that the bottom is smaller on the ground and want to try another one that has more ground coverage. Because I wanted something to help me get into the bathroom besides the doorknob. I use this for balance on my wobbly days. I need added help with balance to walk with a cane. This is lightweight but sturdy. This appears to be a stable solution for my father who has issues with other types of canes. My Dad needs a good cane and I wanted to get him a couple different kinds to go with ones he already has. This one looks good for uneven ground and when snow is on the ground. cuz i cant control my ballance on my feets, i used braces, but still i need the can to help me walk better. To help an elderly person who is losing his balance. To help someone get around better. I'm TRYING this product for the first time. I don't know what the results will be. It would be a good idea to wait until a consumer has had a chance to use the product before asking their opinion." BEST ANSWER: Thank you for your question. The cane weighs 2.2 pounds. We hope this information will be of help to you. BEST ANSWER: Thank you for your question. We do not sell replacement tips for the cane. We hope this information will be of help to you.